Low end Gfx card compatible : 256 colors, 320 x 240 . Vintage view ! Create maximum Fun & Cute thing with a minimum ! Until now, most of these creations are inspired by nostalgic arcade games from Nintendo, Atari , CPC Amstrad, ZX Spectrum, Vectrex console or even V-Tech Handheld LCD games. 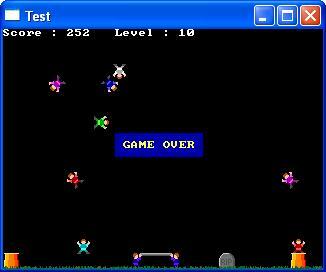 All provided .bas files can be compiled with freeBASIC version 0.15b and later. All .bas files were tested with Windows and Linux... Should works with DOS but not tested ..
you've to succeed to land your ship without crash. 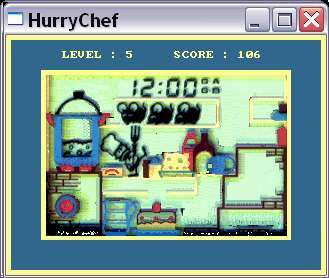 by pressing F1 inside the level editor, you'lll have more help to use the editor. Good or bad comments are welcome on the FreeBasic forum "All in One" topic at "FreeBasic Forum topic 8405"
Good or bad comments are welcome on the FreeBasic forum "All in One" topic at "FreeBasic Forum topic 3926"
He has to hop on and off the lifts to open the valves on the hoppers. The hoppers have to be emptied before they reached their limit. Only one load of concrete flows with each lever action. When one hopper is full, a warning signal sounds. When the score reaches 300 points, all misses are canceled. 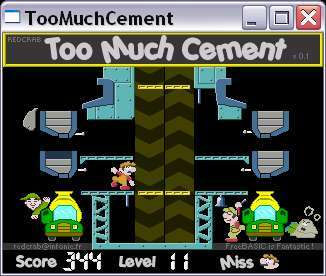 Good or bad comments are welcome on the FreeBasic forum "Too Much Cement" topic at "FreeBasic Forum topic 3828"
This is a game directly inspired from "Sleepwalker" LCD handheld game from V-Tech 1981. Good or bad comments are welcome on the FreeBasic forum "Sleepwalker" topic at "FreeBasic Forum topic 3170"
then the "Cook machine" get more "Heat"
Good or bad comments are welcome on the FreeBasic forum "Hurry Chef" topic at "FreeBasic Forum topic 3038"
Good or bad comments are welcome on the FreeBasic forum "Bouncing Stuntman" topic at "FreeBasic Forum topic 2934"
Catch all falling raindrops ! 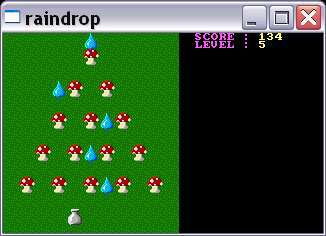 Good or bad comments are welcome on the FreeBasic forum "Mushroom raindrop" topic at "FreeBasic Forum topic 2869"
Sorry these titles were so crappy, I refuse myself to be identify with these pieces of crap code. I keep references number , just to remind myself from where I come from... In addition I refuse to publish unfinished games. And all the QB/FB Community !